Walking into Emmerson in downtown Boulder is a delightful experience. It’s inviting, relaxing, warm, soothing and, immediately, and, almost impatiently, let’s you know you’re in for a treat. The ambiance is modern but retro and the simplicity is perfectly apportioned for Happy Hour allure, as I walked in to meet a friend who I haven’t seen in far too long. I love the juxtaposition of this place. Yes, it is “fancy.” But, not overstated. While it is certainly possible, you don’t have to spend a ton of money here to enjoy it. Emmerson is playful on one side but entirely inviting and down to Earth at the same time. 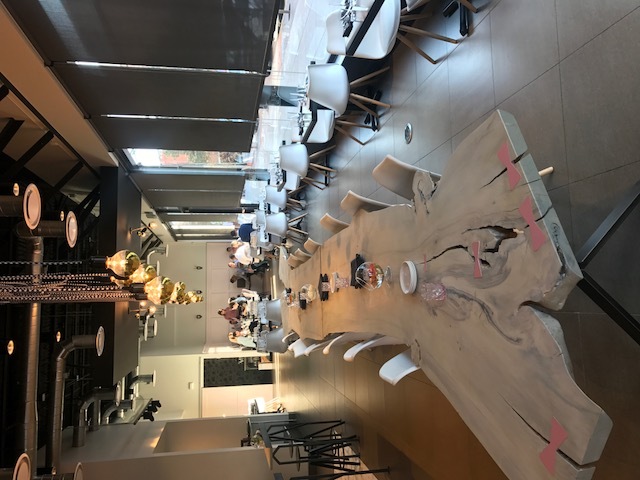 I can only say it is rare when an establishment attempts so much and succeeds as well as Emmerson has with this new neighborhood gathering place and destination restaurant for those of us that live miles from downtown Boulder. The Happy Hour / Drinks menu is sure to please. I enjoyed the Hi-Teq and a glass of the happy hour wine with the Gougère (a delightful Burgundian cheese puff) and charcuterie. 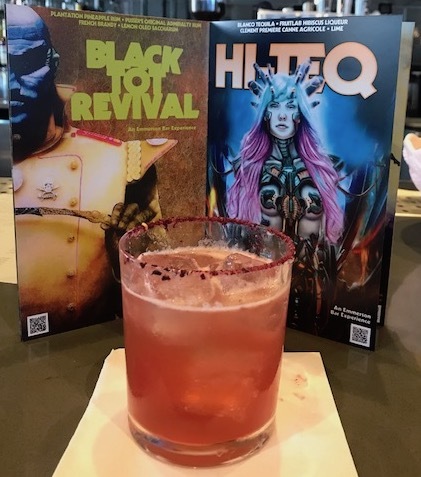 You can rest assured that Beverage Manager Ben Foote, formerly of Jax and Blackbelly, will have just the right options on the drinks menu. What I’m also impressed with is Emmerson’s commitment – more like a passion – for community. And it is not just the striking communal table that reinforces this message. Knowing many of the winemakers devastated by the wildfires, Emmerson is offering several glasses of wine where all proceeds will support the Winemakers & Sommeliers for California Wildfire Relief (WSCWR). Just look for the wines highlighted in red on the list. Proceeds are being channeled directly to the un/under insured workers and employees of the wineries as many have lost their jobs as a result of the fires and there’s no telling when these jobs will be coming back. If you would like to go a step further, Emmerson is hosting a benefit dinner for WSCWR on Monday that I am sure will be exquisite and delightful. Check out their Instagram page for a closer look!